For many years, the nomads used Tibetan tents. In fact, it is still being used today as the ideal form of accommodation when traveling from one place to another. These tents are made from a thin material, and are held in place using wooden poles and wool rope. Centuries ago, the nomads used the tent as temporary shelter. Inside the tent, you can find some things like table, little food, blankets, sleeping mats, and a stove. At present, there is a decline in the production of hand-woven tents because there are now modern Tibetan homes such as apartments. Aside from that, many towns now have conventional homes and are no longer staying in the tents. For many years, the tents have become an integral part of the life of man especially the nomads. With every change of season, these people tend to find a new place where they can put up their simple home. The material used in the Tibetan tents is very thin, and you are able to see what's outside. The yarn is hand-spun and is different from the tents used by desert tribes which are usually thick to block sand or sunlight. A very unique feature of the Tibetan tents is the opening found on top. The opening allows the nomads to cook inside the tent since the smoke can escape with ease towards the Tibetan moon. During the day, sunshine can also enter the tent which adds up to its functionality. You can see what you're doing and at the same time, you can also see what's happening outside. effective and very simple. Back then, people were very resourceful. Even the ropes are made from yak wool and the poles used in putting up the tents are cut from nearby trees. The ropes are highly durable and are often passed on to the next generations of Tibetan nomads. All these things reveal the simple lifestyle of the Tibetan people. The Tibetan people believe in bad spirits and other evil elements. Because of this, the tents are often adorned with prayer flags. The flags are very colourful, in rectangular cloth. These cloths are very symbolic and are believed to defend against evil spirits. The prayer flags serve as protection to the nomads while they are traveling from one location to the next. At present, the Tibetan tents are now very much different from the hand-woven tents. Although the latter is still being used, you can now find tents made from waterproof fabrics, canvas, and many other materials. Most of the modern tents have auspicious symbols and lucky signs that are long-used by nomadic tribes. Instead of serving as a temporary home, the tents are now being used during picnics. There are many designs, colors, shapes, and sizes of tents being sold in the market today. You don't have to hand-weave the tents because ready-made ones are available. All you have to do is log online and check out the amazing pictures on the online stores that sell the tents. The tents have withstood the test of time. 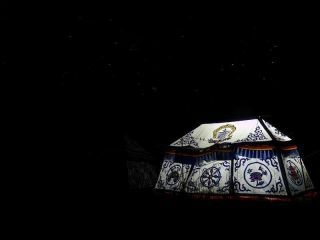 Even if the modern tents are now easier to manufacture, the Tibetan tents still stand out because of its unique design and durability. Join in and write your own page! It's easy to do. How? Simply click here to return to Tibetan Stories.